Cidade Maravilhosa in grand style. In the year 2000, Brazil marked 500 years since its discovery. At the instigation of Ricardo Cravo Albin (who came up with the scenario), the state of Rio de Janeiro commissioned the composer Francis Hime to write a popular symphony to commemorate the occasion. For Hime this couldnt have been an easy task, as the symphonic MPB path had already been trodden by none other than Tom Jobim, who composed the first Sinfonia do Rio de Janeiro in 1954, with Radamés Gnattali as orchestrator and conductor. There are a number of similarities between the two compositions. Both utilize popular rhythms in orchestral settings. Both employ a recurring leitmotiv that punctuates a series of individual movements. Both highlight various aspectsgood and badof the city. And both feature a group of well-known vocalists, each singing a solo part. There the similarities end. Toms Sinfonia, co-authored with Billy Blanco, was a relatively brief (15:40 min.) contemporary portrait of the city, a cocktail of impressions that mixed admiration for its natural beauty (Rio de Janeiro/que eu sempre hei de amar/Rio de Janeiro/a montanha, o sol e o mar) and scenes of daily life (Sete horas, quanta gente vai à rua procurando ônibus, trem!/ Não vem o lotação!/ Atrasado pro trabalho/ Resultado: confusão!) filled with carioca tidbits like the cafezinho habit, gafieiras, football games, the beach, and focusing on the contrast between the Zona Sul and the morro. The pre­bossa nova music and arrangements owed a heavy debt to Broadway. 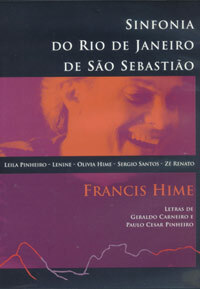 Francis Himes Sinfonia, with lyrics by Geraldo Carneiro and Paulo Cesar Pinheiro, is a broader (and longer50:38 min.) canvas, painting the citys entire history in five chapters, each represented by a rhythm typical to its period: the lundu of Colonial Rio (from the discovery until the declaration of Independence by Dom Pedro I in 1822); the modinha of Imperial Rio (18021889); the choro of the Belle Epoque (18741930); the samba of the so-called Época de Ouro (19301957); and contemporary Rio (from the introduction of the bossa bova until now). Hime is able to offer his listeners a luxury not at Jobims disposal: the new Sinfonia is available on DVD. The primary footage consists of the concert given at the Teatro Municipal on 30 November 2000 under the composers baton. Into this are intercut numerous stunning views of Rio. The modinha movement is laced with historic art, while the samba movement chimes in with images of carnaval. During the concert one can observe not only Hime and the soloists but individuals in the chorus (e.g., Eveline Hecker and Ari Bispo) and the orchestraWilson das Neves, Jorginho do Pandeiro and his son Celso Silva, Tutti Moreno, Luciana Rabello, and Vittor Santos are some of the notables. And thats not all. You can watch the Sinfonia whole, movement-by-movement, or with commentaries by the principal personages involved; with or without subtitles; in four screen sizes; and with two Dolby options. There are biographies of all concerned on the disc, in addition to a bilingual booklet with lyrics and notes by Flávio Marinho and Ricardo Cravo Albin. Sinfonia do Rio de Janeiro de São Sebastião is a thoroughly professional and satisfying production that doubles as an exciting travelog. And thats saying a lot. (Biscoito Fino CD BF504/DVD BF507; 2002) 50:38 min. (Continental 1.000; 1954 [LP]/Continental Warner 450999180-2; 1995 [CD]) 15:40 min.